I can’t quite believe it’s Labor Day. Classes will start next week, and I’ll be full and officially into my first year of professoring. Crazy. But, much as I’d like to believe that summer will last forever, I’ve been noticing the sun sinking down below the horizon earlier and earlier each night, and coming up later and later each morning. I’ve even seen a couple of leaves beginning to turn, but only on the most pioneering of trees. 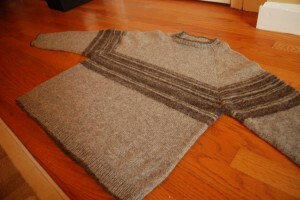 Yesterday, I took advantage of my last Friday off of the summer to sit myself down and finish the Mike sweater. It was at the stage where one good push would finish it, and this morning I bound off on the second cuff and wove in all the ends. Here it is in its pre-blocked state. It’s clearly a bit too big for me, especially in the shoulders, but I think that means that the fit should be just about perfect. And it is really comfortable. This is one of those sweatshirt sweaters that you could live in, and I think he probably will. The whole way down the sleeves I was sure that I would run out of yarn. 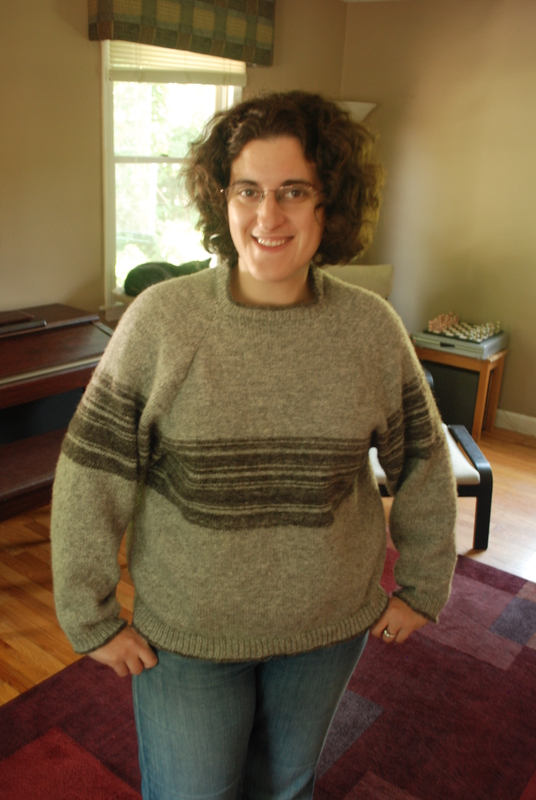 I had weighed the sweater before pulling back to the armpits to rework the sleeves with a little less bulk, and I wasn’t sure I’d even make it to the end of the sleeves, never mind through the cuffs and ribbing on the body. And yet, somehow, the ball of yarn just seemed to last forever. 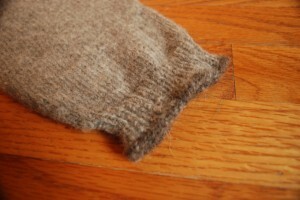 I got to the cuff on the first sleeve, and it was clear that I’d have enough to finish the second. Then I finished the second, and still had enough yarn to try for the neck ribbing, then the hem ribbing. As it turned out, I even finished both sleeve cuffs on the same ball of yarn. It just stretched forever. I even had one tiny (0.5 oz) skein left over, perfect for mending and repairs as the sweater lives its life. I forgot to get a final weight on the sweater before soaking it for blocking, but I think it used almost exactly 25 ounces in the end. I had 1094 yards of the lighter Harriet yarn, and added in about 200-250 yards of the darker MacGyver yarn to stretch it out. I used size 2 needles, and got about 6.5 stitches and 8.5 rows to the inch. I decided to do the bind off in the darker yarn to match the chest stripes. Walden used an accent color to bind off for her Spiral Shawl, and I loved the way it tied in colors from the main body of the piece, so I used the same trick here. 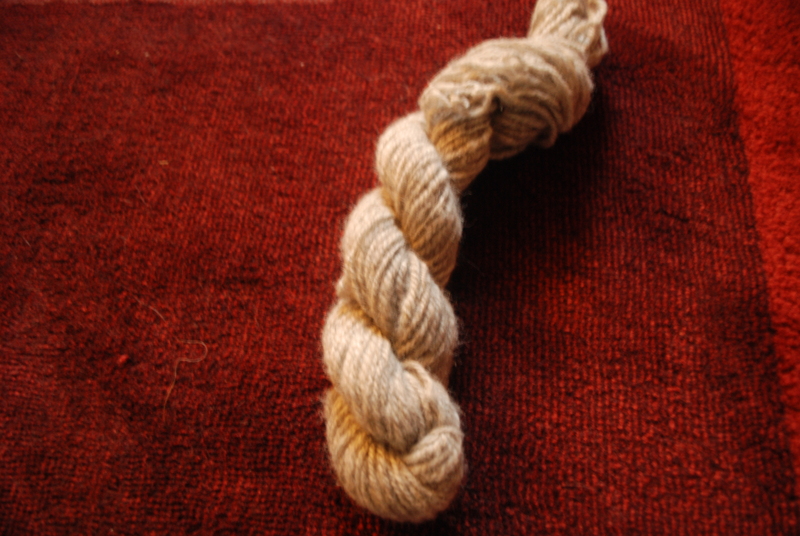 In all, it took me 35 hours to spin the yarn, and 52 hours to knit it. Next time someone asks me how long it takes to make a sweater, I’ll know the answer. I think this is just about the perfect way to start the fall. Congratulations on a job well done!! The sweater is lovely and I’m sure Mike will thoroughly enjoy it.Are you ready for the students next week? It does look super comfy! I’m glad you like my bind of enough to use it. How are you feeling about classes starting? It is such an awesome sweater. Yes, too big for you by far, but seeing it modeled really shows how comfy it will be. I like the contrast bind off very much indeed. Very nice! It looks like a perfect fall sweater. Good wishes for your classes this fall! DesigKnit is powered by	WordPress 4.8.9 . Page generated in 0.287 seconds using 45 queries.